This is a guest post from fellow points/miles enthusiast and TDM friend Ben Komenkul. 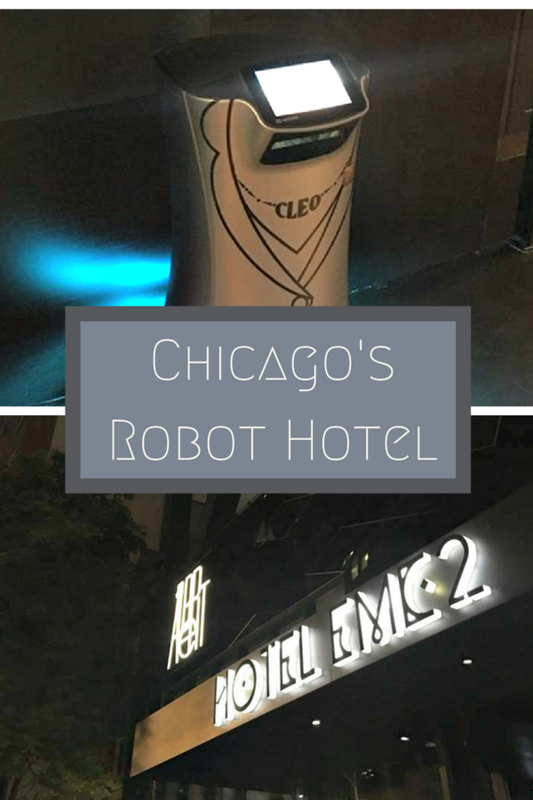 Ben recently checked out the new Marriott EMC2 in Chicago and I asked him to share his thoughts. Here is his Marriott EMC2 Hotel Chicago review. Thanks, Ben! Since I recently completed my qualification for Globalist for Hyatt Hotels, I felt that status with another large chain with a Global Footprint nice to have. I heard about the Marriott Platinum challenge recently through Deal Mommy. I’ve had mid tier Marriott Gold Status through a SPG Gold status all compliments of holding American Express Platinum credit card since last year. I was thrilled to find out I could request a Marriott Platinum challenge to stay 9 different stays in 90 days in Chicago. I recently heard that Marriott opened a new property just a few months ago –Hotel EMC2 – under the Autograph Collection in Chicago. If you choose an award stay, this is a Marriott Category 8 property at 40,000 Marriott points per night. However, I chose to pay cash at $242/night since I needed a paid revenue stay for the challenge. It was a sold out evening in the Magnificent mile area of Chicago where other similar hotels were running $350-$500 a night. I felt it was a good deal due to many Marriott loyalists not being familiar with this brand new property. EMC2 is a themed property with a focus on Science and Technology. It seemed as soon as I walked in that the trend towards automation goes beyond Mobile Check in here. Although I completed Mobile check in just a few hours before my 10pm arrival I wasn’t sure if it would reduce my chances of getting an upgrade. However, the app seems to address it and says I would still be eligible. When I arrived, the front desk agent acknowledged my Marriott Gold status and just needed ID to verify before she handed me the keys. 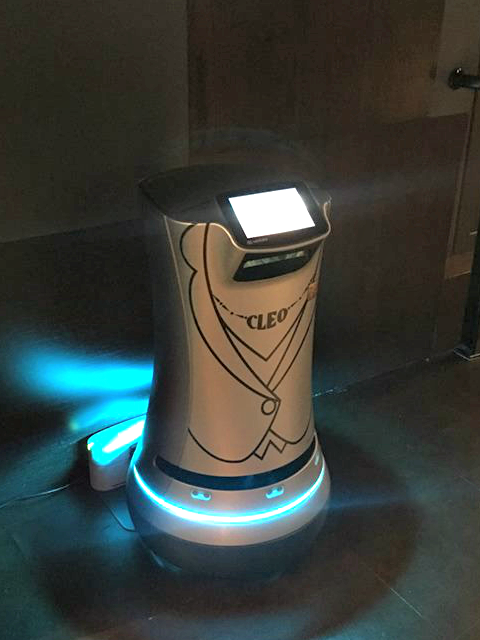 She advised me that they have a texting program to request items needed and CLEO the robot would be up to deliver it. The elevator has technology that makes you choose the floor before you enter and directs you to one of three elevator banks. I got lost later when coming down to the Lobby, I wasn’t sure if I should choose “1” or “G”. By the way, G stands for Basement. Signage could be improved here. The property has no executive lounge, so they offered me 750 Marriott Points or Continental breakfast for 2 guests at the hotel restaurant as a Marriott Gold. I chose the Marriott Points because I like to sleep in but breakfast was good according to other guests. Since there was no line at check-in, I was up in my room within a few minutes. I like the vibe of this 8 story, 195 room boutique hotel as they have art on each floor. I was assigned a standard King room, 300 square feet, on the top floor reserved for Elites. While it was perfect for a solo traveler, I couldn’t imagine fitting more than two adults and a small child in this room. There is no room for a rollaway bed unless I blocked the front door- obviously not an option. I agree with Ben- this is unusual. As soon as I entered my room I noticed right away that the shower was in the middle of the room. 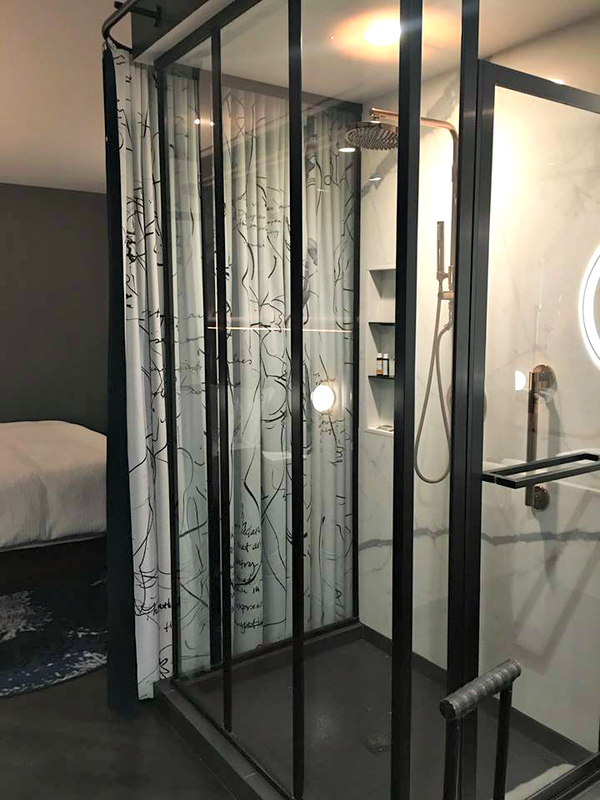 No tub, just a glass shower with a curtain around it for privacy. The closet was a steel mesh reminiscent of a nice gym locker. One interesting item in the room was a brass horn amplifier that allowed me to slide my mobile phone in and play music pretty loud. The entire room had a chemistry motif near the sink with test tubes decorations. I realized the bedroom floor was mostly thin carpet and laminate flooring which I dislike since I like to walk around barefoot. So I texted the front desk my request for Men’s slippers and toothbrush. The front desk responded immediately. Within 10 minutes, I got a message on the TV screen that an attendant was at the door. When I opened the door, a Robot named CLEO was at the door waiting for me. I reached into the robot to collect my super comfy slippers and my toothbrush. The best thing I liked about it was not having to worry or feel any pressure to leave a tip. Overall, CLEO was quick and efficient. Full disclosure: I’m the Justin Ross Lee of slippers. I have no shame in calling downstairs and ordering multiple pairs of slippers. 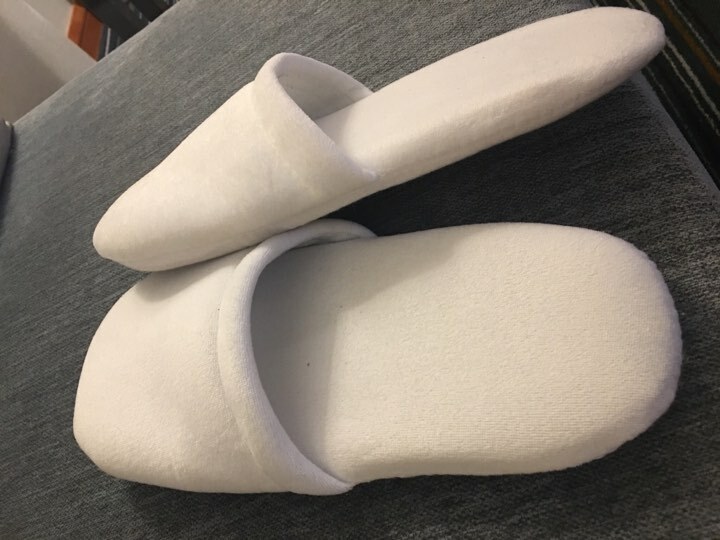 I have a hotel slipper collection at home that I give away to the homeless in LA. But who knew that these EMC2 slippers would be AMAZING! I don’t think I have ever worn soft foam pillows as footwear. These have to be highlight of all the amenities here. In fact, I’m been wearing them on the plane and in every hotel room since that day. There was also an Alexa personal assistant in the room that is standard in each room. I didn’t feel that it brought much value since it was late and too much trouble to learn how to ask for a restaurant recommendation that I could just Yelp. They got the bedding right complete with high thread count sheets and a fluffy comforter. I didn’t check out until 4pm and as I requested late check out and the hotel never gave me a hard time about it and housekeeping didn’t come to bother me. Shower- Water pressure great and warm water not a problem. Luxury Toiletries were nice touch. Bedding – Comforter was appealing and soft like marshmallows. Overall I would stay at the EMC2 Hotel again and try their breakfast next time. Thanks so much, Ben, for sharing your impressions! If you have stayed at an unusual property- or have a story to share- let me know.